As they say, the landing’s the thing! Yes, indeed it is. And Instructors often ponder how students learn to land. We can lay out all sorts of detailed advice and description, and we pride ourselves in being experts at critiquing an approach and landing. Ultimately, however, it is the student alone who must walk through the door of enlightenment. We can help students up the path that leads to the door, and we can even help put them on the threshold and open the door. But it is always the student—alone—who puts it together physically and mentally and passes through the door to the other side. Time and time again, Instructors see their students experience this moment of enlightenment as they pass through the door and, often quite suddenly, simply “know” how to land. It is a moment that is equally special for the Instructor as it is for the student. It is important to realize that contemporary flight training was born from military tradition of pilot instruction during the 1940s. Faced with the crisis of that period, as many pilots as possible had to learn in the shortest period possible. At that time, the flight training effort was in factory proportions, and the number of hours required to complete a first-solo flight considered a solid measure of “trainability.” If training was not completed in eight hours of flying, the candidate was “washed out” and sent to the infantry. Historically, then, the number of hours required to solo became a measure of a pilot’s skill and ability. The fewer the hours, the greater the skill and ability. This measuring stick—which was a measure of how little skill and ability these new pilots had—has long since been buried. Things are different now and safety and security have primacy. The first solo flight must and will be a safe flight, and it is as simple as that. As you begin circuit training, remember that rarely is the pre-solo phase clear of frustration to some level. It takes time to learn the skills required and it is important to accept this. Frustration, of course, is a function of student commitment, hard work, high standards, and determination—all of which are positive qualities; so frustration, insofar as it represents commitment, etc. is not a negative thing. However, frustration that impairs learning is not productive, and it is here that patience must prevail. Frustration has the effect of shutting down the advanced mental pathways required to learn a complex physical and mental skill; patience, on the other hand, will open these pathways and permit learning. How does your Instructor determine when you are ready for solo flight? The criteria we apply are really quite simple. From the Instructor’s perspective, there are three basic yet distinct phases in pre-solo training. The phases often overlap and they can occur over a series of flights, or even during one flight. The first phase is where, during training, the student receives both verbal and physical assistance from the Instructor. During the flare, for example, the Instructor may verbally prompt the student to “raise the nose,” and the Instructor will also have to physically make the inputs to assist the student to ensure the nose is raised. Obviously, we all start here. In the second phase, verbal prompts will be all that is required for a correction to be affected. “Get the nose up,” the Instructor might say over the intercom, and the student will hopefully raise the nose in response to the Instructor’s prompting. The verbal prompting simply indicates that the positioning and configuration of the aircraft—for example, speed, flap setting, angle of attack, positioning of the aircraft’s longitudinal axis, etc.—is outside the Instructor’s comfort zone and a correction is required. When verbal prompting is all that is required, it indicates that the student has the skill to make the corrections necessary to get the aircraft back in the Instructor’s comfort zone. If the correction is not made in response to the prompting, the Instructor will automatically resort to physical assistance. The third and final phase is when neither verbal nor physical assistance on the part of the Instructor is required. The student’s comfort zone matches that of the Instructor, and is now able to recognize a deviation from the desired state, and undertake the necessary corrective measures. The dual flight preceding the solo can involve all three phases, but for a student to be released for a solo flight there must be a clear conclusive transition to the third phase. 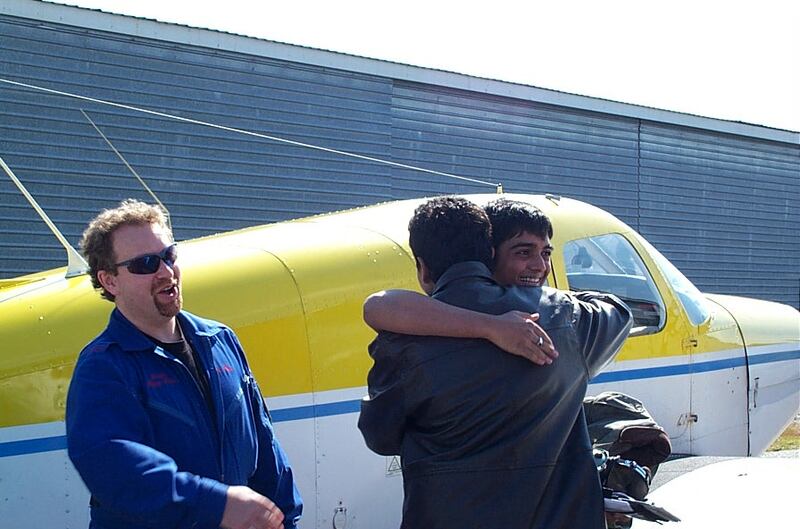 Typically, on the day a student is released for solo flight, the Instructor begins with the preconception that this flight could be the one where the student will be released. On the previous flight, the student demonstrated competency; perhaps there is still some refinement to work on, but basically it is “any flight now.” On this day, the winds are tame, the pre-solo items on the Instructor’s Check Sheet have been signed off, the student has already been issued a Student Pilot Permit, and everything is in place. All that is needed is student performance. From the beginning of the flight, the Instructor will start making a mental note as to how many landings have been clean “phase three” landings, where the student has not required any verbal or physical assistance. The Instructor has essentially started “a count.” The student must perform a series of not less than three clean phase-three landings. If this is completed successfully, the Instructor now has the green light. The Instructor may want to see one or two additional circuits just to ensure the trend is solid, and with this the Instructor will likely release the student for a solo circuit. If, however, during that sequence, a “phase two” or even a “phase one” landing occurs, and verbal or physical assistance is required, “the count” returns to zero and the attempt to complete a clean series of landings begins again. During the circuits leading up to the first solo, anticipate the Instructor commonly to assume a “silent” monitoring role, where the student’s ability to recognize correct deviations are being assessed. The first solo flight will always be just one circuit. This is policy. It is not uncommon for the first solo circuit to come at the end of intense one-hour training flight, but it is rare for a first solo to occur if the flight extends beyond one-hour, after which fatigue could affect student performance. Interestingly, both the student and the Instructor usually know when it is time for the Instructor to get out for the solo release. On the flight following the first solo flight, the Instructor will again apply “a count.” When a minimum of three clean landings is completed, the student will likely be released for remainder of the flight to fly solo circuits. If the conditions are not right for solo—e.g., owing to wind or visibility conditions—the planned solo flight will be converted into a productive dual flight.1 Through the training—before and after the first solo flight—the Instructor’s job is to have his or her students exposed to as much variety in flying conditions—especially landing conditions—as possible. Even if conditions are right, however, it is unlikely that a student will be allowed to fly more than an hour in total—circuits, as you may already know, are physically and mentally quite demanding. Freshly soloed students should be aware that Langley Flying School has specific procedures that govern the release of students following their first solo flight. An Instructor authorizing a solo flight is responsible to ensure the student is safe and competent in view of the anticipated weather conditions—primarily the wind and flight visibility. And this applies generally to all solo training flights. In the case of students who have recently soloed, however, the Instructor’s supervision requirements are more specific. In flights following the first solo flight, the Instructor will conduct a series of “pre-solo check rides” prior to each flight in which solo practise is planned. During these check rides the student must demonstrate a minimum of three competent and safe landings prior to being released solo. Generally, these mandatory check rides will last until the student has completed three solo flights (excluding the first solo circuit) and has accumulated not less than three-hours’ cumulative solo flight experience in the circuit. 1 Even if strong winds exist, the student will be released provided the skill and experience is demonstrated to the Instructor.